One of the most popular spots at the zoo or amusement park on hot summer days is not necessarily one of the main attractions. It's the misting stations that draw in a consistent crowd eager to feel cool and refreshed before moving onto the next wild animal or wild ride. 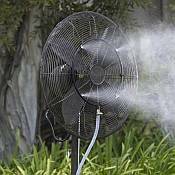 Creating your own personal misting station is much easier, much more pleasant, and much less expensive than spending hot summer days with the family at a pricey zoo or park. The way to accomplish this is with a misting fan.